I am expecting my second child this August so quite naturally my thoughts are nearly constantly on the growing miracle in my belly. In addition, since my last trip to Haiti in October, I have thought frequently of the Haitian people and have been eager to visit again. Friday I finally flew to Haiti again to visit several maternity programs and to spend some time with my fellow expecting mothers, and what I found, was inspiring. The Haiti I just visited is not the one you’ve read about. Since the tragic earthquake in 2010, the stories from Haiti have focused on destruction and devastation, on international players not doing enough, and organizations scrambling to fill the service gaps that an overstretched government hasn’t been able to provide. While it is true that there is an enormous amount of work left to be done, after meeting the Haitian leadership at St. Damien’s and St. Luke’s Hospitals, I can tell you first hand that there is a great deal to be hopeful about in Haiti. In a country where one out of 37 women is at risk of dying form pregnancy related causes during her reproductive years, St. Damien’s and St. Luke’s are ensuring that women have access to the care that they need both during and after their pregnancy. St. Damien’s maternity unit, led by Haitian OB/GYN Doctor Aupont, performs 500 births per month, many of them high risk, low birth weight children that are given place in their neonatal program. Walking into the neonatology unit, I was overcome at the site of these beautiful babies. It made me think of my own experience as a mother, made me appreciate how delicate these little lives are, and made me grateful for the work being done to fight for and protect them. The high quality of care provided has made St. Damien’s Maternity the referral hospital for the most difficult cases in the region. I am grateful to Doctor Gautier, St. Damien’s Medical Director and mother of three, as well as Doctor Aupont and his staff, for fighting for these children. I had the pleasure of meeting both of these devoted and inspirational doctors who serve as such a force for progress in their country. Next I visited St. Luke’s maternity clinic, Manitane, directed by another inspiring Haitian mother and doctor, Dr. Blaise. 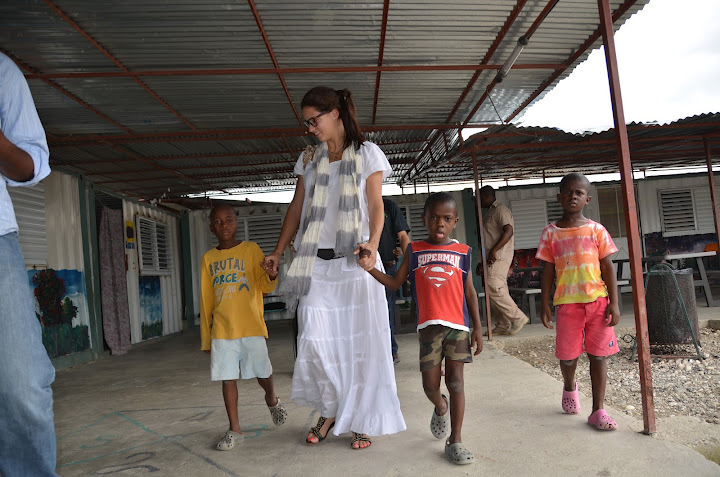 Manitane works in close coordination with St. Damien’s, and provides exams, consultations, vitamins and referral services to over 1,400 mothers a month. The first visit post-birth happens at Manitane as well, and once babies are born, the St. Damien’s facility ensures that these children have access to quality health care throughout their childhoods. St. Luke’s also operates remote clinics in Cite Soleil and Wharf Jeremie, two of the most underserved communities in the greater Port au Prince area.